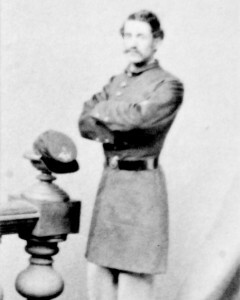 Francis Cogswell Young (1843-1909) was one of the five Marland cousins, all grandsons of Andover industrialist Abraham Marland, who served together in Company G of the Massachusetts 44th Infantry. Frank was born in North Andover to clergyman Jeremiah S. Young and his wife Harriet Fletcher (Marland), but his life took a sharp turn after Harriet’s sudden death in 1850. Jeremiah Young was remarried almost immediately to an extremely wealthy widow from Fall River and, retired from the ministry, became involved in woolen mill investments. In association with Harriet’s brother John Marland, Jeremiah became the first treasurer of the Pacific Mills in Lawrence but this partnership was interrupted by Jeremiah’s incapacity (perhaps a stroke) in 1857. Frank Young attended Phillips Academy, living in an Andover boarding house, until his father’s death in Fall River in April 1861. After the war, Frank Young moved to California, living first in the Santa Barbara area where he was married in 1876. The 1900 census found him working as a “steward” and living with his wife and three daughters on the grounds of the Agnews State Hospital in Santa Clara, known for its progressive and compassionate care of the insane. If they were still in residence in 1906, they were apparently unharmed when, in the greatest tragedy of the San Francisco earthquake, the complex’s multistoried main building collapses, killing one hundred patients.